People the world over talk about religious freedom but how often have we seen it being implemented in letter and spirit? Take the case of India, where particularly in the last year or so, there is increasing intolerance among the various religious groups in a supposedly secular nation. The majority dispensation is literally bulldozing its way around at the cost of the minorities. In the United States, there is intolerance of another kind – Blacks against Whites – and vice-versa, not to mention the centuries old hatred that manifests itself with sickening regularity. Russia, nations in Europe, the Far East, Latin America etc, there is talk of freedom but is there any? Having been in Bahrain for close to two decades, I have always been awestruck with what I see here. Several Hindu temples, gurudwaras, a score or so churches, and even a synagogue all co-exist along with dozens of mosques in perfect harmony in an Islamic nation. We see Bahrain’s rulers and senior ministers, bureaucrats and officials take part in Hindu and Sikh festivals and occasions; they visit temples, sit, pray and eat with the community and address gatherings. One does not feel ill at ease practicing one’s religion at any time. 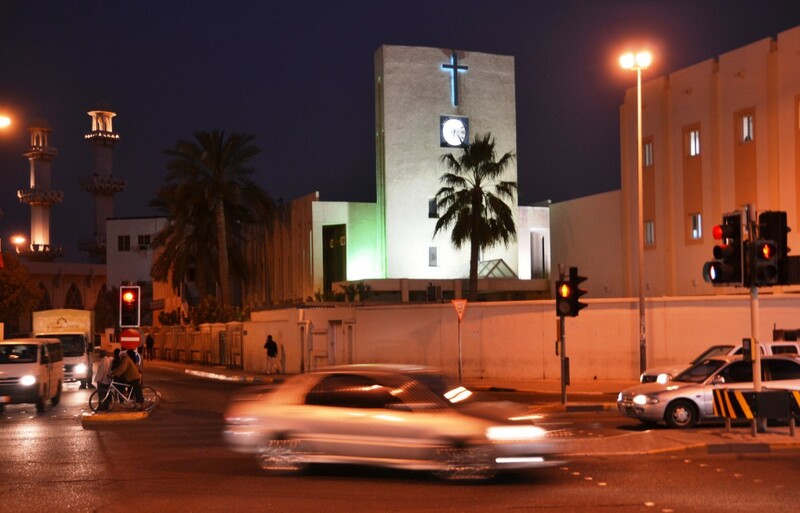 The picture on the top of this page – showing one of Bahrain’s oldest mosques and the oldest church in one frame – perhaps signifies this like nothing else. Countries like India and the US, among others, should learn from Bahrain. It’s not about being constitutionally secular; it’s about practicing it in spirit! Oh did you say secular ???? I don’t think they even care. Saffronization seems to be the mood of the morons …secularism be damned ! Nice write up ! Morons – that’s the word for them! !